We had a serious bullying issue at our school. At the suggestion of Play With Purpose founder Jason Pine, we decided to try games as an anti-bullying measure. The results were dramatic. We instantly created an atmosphere where all our students felt safe and empowered. It was truly remarkable. Sharp Leaders Program to help students develop communication and leadership skills, but more importantly, help them understand what it means to lead, when to lead and how to lead with dignity and grace. Identifying campus leaders and empowering them to change your school’s climate. * Per school. Contact us for district pricing. Bullying Education does NOT equal prevention. In fact, researchers have found that students are more likely to have experienced bullying at schools that have installed an anti-bullying program. As bullies become aware of the behaviors that schools are trying to thwart, they change their methods to avoid detection. Educating students on the effects of bullying on the bullied and those who bully, bringing awareness to the issue and providing help for victims of bullying is simply not working. We have decades of research that have given us a better understanding of why bullies bully and the effect is has, not only on bully victims, but also the bullies themselves - yet the problem persists. It must also include character education to empower students to not only have the self-confidence, self-worth and self-esteem to stick up for themselves, but also to have the strength, courage and gumption to hold others accountable for their behaviors when they see bullying happening to others. 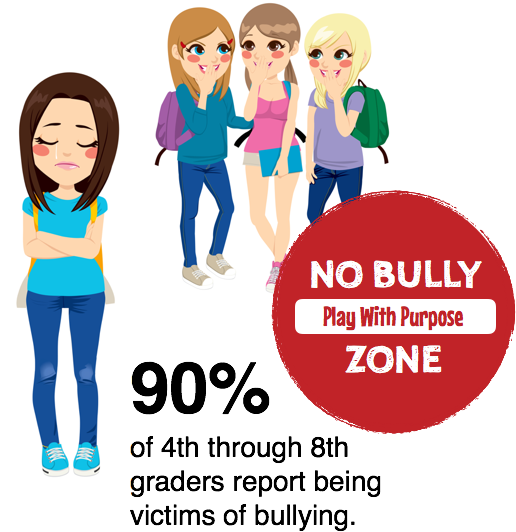 Play With Purpose’s NO BULLY ZONE Program takes a holistic approach to prevent bullying using PLAY to break down the barriers that lead to bullying tendencies, thoughts and behaviors. The added bonus is that the games we use in the NO BULLY ZONE Program were all selected by teachers to build, strengthen and develop theEMOTIONAL, AFFECTIVE, PHYSICAL, ATTENTION, LANGUAGE, SOCIAL & COGNITIVE abilities of your students.